Before turning to the five recordings being reviewed, I'd like to offer my views on performance practices concerning baroque and classical era music. The two approaches may be referred to as "traditional" and "historically informed". The traditional approach held center court well into the latter half of the 20th century and was dominated by the popularity of romantic era music which required large orchestras and lush sound. Essentially, what was good for Tchaikovsky, Dvořák, etc., was also considered right for Bach, Handel, Haydn, Mozart, and the other composers of the baroque and classical eras. This "one size fits all" thinking resulted in relatively thick textures, rounded contours/phrasing, massive waves of sound, a wide and pervasive vibrato from the strings and human voice, and woodwind/brass contributions integrated into the fabric of the strings. Thanks to the pioneering work of historical performance specialists such as Gustav Leonhardt and Nikolaus Harnoncourt, as well as the musicological community, an historically informed approach to early and classical era music was developed replete with period instrumentation. Simply changing the instruments employed gave the music an entirely different sound, but much more was involved. Orchestral size was reduced, tempos were faster, textures were leaner, contours and phrasing became much sharper, vibrato was reduced to minimal proportions, and the woodwind/brass instruments gained prominence as they were freed from the dominating string sections. The new HIP approach was treated like poison by the more extreme members of the traditional bloc such as Pinchas Zukerman who stated that musicians taking the HIP route did so only to hide their abysmal technique and artistry in a far less competitive field within classical music. The other basic complaint was that HIP equals ugly: ugly sounding instruments, ugly vocalism from the "white" sounds of soprano Emma Kirby, tempos that didn't allow the music sufficient breathing room, and a general lack of musicality and expressiveness. For their part, the more extreme members of the HIP movement were equally obnoxious and nasty, basically referring to the traditionalists as misguided folks who made an abortion of early, baroque, and classical era music. Although decades have now passed, the extremists on both sides continue to berate one another, failing to recognize that both approaches can well co-exist to the benefit of audiences. The most recent development in this story of musicology, aesthetics, and dysfunctional personalities, is the mix of modern instrumentation with an historically informed approach to music-making. This stage was inevitable given that many music professionals think highly of some of the features of the HIP movement such as leaner textures and quicker tempos, but have never found themselves fond of period instruments. This blend of HIP and modern instruments can now be found in many recordings of Beethoven orchestral music and has even extended to performances of the music of Bruckner, Brahms, and Wagner. Concerning the comparison recordings in the heading, folks such as Oistrakh, von Karajan, and Bohm are clearly in the traditional camp; this is no surprise based on the era in which they performed. Szell, Marriner, Levine, Leppard, and Colin Davis occupy a less heavy regimen, while Mackerras is the epitome of performances using modern instruments with a historically informed aesthetic. Of course, Hogwood, Standage, and Huggett represent the most comprehensive display of the HIP approach through use of period instruments. With the above in mind, where do Pamela Frank and David Zinman reside? Well, Zinman is definitely in the modern instrument-HIP aesthetic mode. His orchestral forces are reduced, tempos are uniformly brisk, contours are sharpened, and his textures are 'lean and mean'. Overall, I have little complaint with his conducting on the Arte Nova set. Although the slow middle movements are quickly dispatched, Zinman never loses sight of the music's poignant nature. I do have a couple of quibbles though. The first one is that his phrasing is not sufficiently fluid in the 1st Movement of Concerto #1. The second concerns the issue of cadenzas. Zinman uses his own throughout the set except for Concerto #5 where cadenzas by Joseph Joachim are employed. Zinman's cadenzas for the other works are a model of good taste and style, but the Joachim cadenza to the 1st Movement is an excessively angst-ridden and romantically overblown failure entirely out of tune with the music's upbeat nature. A cadenza that might be appropriate for Brahms or Tchaikovsky is nonsense when applied to Mozart, and I am very surprised that Zinman didn't have the good sense to realize this fact. My enthusiasm for Zinman's performances is much greater than I can muster for Pamela Frank. Actually, I have no enthusiasm for her interpretations and feel that the music is more enjoyable when she is absent. Her style is to take the vibrato from the traditional school and the shortened note values from the HIP aesthetic. Sorry, but it's a poor match. Perhaps more damaging, Frank is not particularly expressive and her tone is quite anemic: no body, resonance, or depth. Two thumbs down for Ms. Frank. 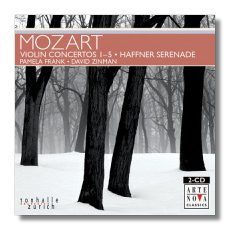 Most 2CD sets of Mozart's Violin Concertos have some bonus material, and Zinman offers three movements from the "Haffner" Serenade. I suppose that these movements can be looked at as a violin concerto, but having an Adagio as the initial movement is certainly unconventional. At any rate, Zinman conducts expertly and I love how he highlights the foreboding characteristics of the Menuet. Unfortunately, Frank is also involved. Final opinion of Zinman/Frank? At premium price, this set would have little viability, but the Arte Nova super-budget price is significantly lower than what Naxos charges. Given the minimal cost and Zinman's fine conducting, I can give a mild recommendation to the set. Still, this is low priority and Pamela Frank carries the burden. Next on the agenda is the newly minted Anne-Sophie Mutter set where she also directs the London Philharmonic. Mutter is one of the most popular classical artists in the world, and she got her rise to fame through her association with Herbert von Karajan. She has already recorded Mozart's Violin Concertos, so it is interesting to compare her new readings with the older ones listed in the heading. 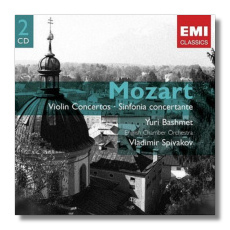 In addition, her partner in the Sinfonia Concertante, Yuri Bashmet, is also found teaming up with Vladimir Spivakov in the same work on the reissued set I am reviewing on the EMI Gemini label. In comparing Mutter with Frank, one immediately notices that Mutter's vibrato is as constant but much wider. This might lead to a preference for Frank except for a crucial consideration – Mutter brings the music to life, while Frank plays from the sidelines. Mutter is vital and aggressive; Frank's playing has a demure quality as if she's a part-timer not wanting to ruffle any feathers. In a sense, Mutter is larger than life. She is to the forefront of the soundstage, and every note/nuance registers with great impact. Her bowing, accenting, swells, and slurring are highly individualized, resulting in performances that one would never forget. Add in the widest range of dynamics I've ever heard in these works, and we certainly have a unique set. Concerning cadenzas, Mutter uses various sources, each one highly emotional and romantic; of course, Mutter wrings every ounce of juice out of them. Given that Mutter dives right into the game, the issue that remains is whose game she is playing. My perception is that she doesn't play Mozart's music as much as she uses it as the launching pad to express her own inner thoughts and emotions. I have doubts that Mozart expected the violin soloist to play like Mutter, but I am confident he would have found her performances totally absorbing. I was reading some reviews of the set the other day from Amazon customers, and their overall opinion seemed to be that Mutter was NOT beyond Mozart's idiom. I have to disagree with that premise; she is well outside reasonable boundaries. However, compelling interpretations don't have to be idiomatic ones. Mutter's conducting is very good. The funny thing is that such a romantic interpreter of Mozart on the violin can be quite HIP minded when directing the orchestra. Tempos are usually brisk, textures are rather stark, and attacks are crisp and propulsive. The contrast between orchestra and solo violin is extreme; whether that's good or bad is something for you to decide. As for specifics, the worst feature of the set concerns the Adagio from Concerto #4; Mutter and orchestra become the equivalent of the "walking dead" with a very slow tempo and zero projection. The other thing that sticks in my mind is how much I love her performance of Concerto #4. For whatever reason, Mutter is much less an interventionist in this work than the others, and the results are wonderful including the more unified mindset between orchestra and solo violin. When comparing these new interpretations to Mutter's previous ones, an additional maturity is evident as well as a stronger penchant for going "outside the box"; her new readings are clearly of a more romantic bent. 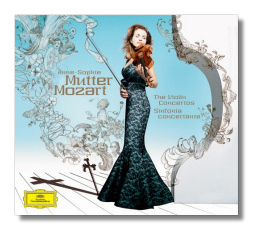 The bonus material in Mutter's set of Mozart's Violin Concertos is the Sinfonia Concertante in E Flat Major, and her performance displays the best and worst of her Violin Concertos interpretations. The 1st Movement is superb as both Mutter and Bashmet stay within the Mozart sound world and deliver thrilling performances with power-packed conversations between them. Unfortunately, each goes into "overblown drive" for the remainder of the work. The 2nd Movement really gets pulverized by ridiculous emotional displays with Bashmet swooning in 'vibrato heaven'; he was much better behaved in his recording with Spivakov. For a role-model performance of the 2nd Movement, the gorgeous and tasteful Grumiaux/Pellica recording on Philips has no peers. Well, I've been thinking of the Mutter set as objectively as possible, but it's time to get down to gut feelings. Mutter's new recordings could have been at the top of the mountain, but romantic excess holds them back. This is definitely not the set to have as one's sole recording of the Violin Concertos, but avid fans of the music and/or Mutter should strongly consider acquisition. All others are advised to sample before deciding. For my part, I intend to keep the set for its best moments and the tremendous violin playing of Anne-Sophie Mutter. At this point, I might as well advance with the Spivakov/Bashmet discs on EMI Gemini. These performances have gotten some bad press, but there are some fine features to consider. Spivakov's conducting is very good. His tempos may be on the slow side, but the pacing is expert and I love the tension he offers from the lower strings. Also, the 1st Movement from the Sinfonia Concertante is superbly played and analogous to the unfolding of a story. As for the soundstage, it doesn't have much sheen but is clean and well-detailed. What I don't care for is Spivakov's solo playing in the Violin Concertos. It is workman-like, lacking expressiveness and potency. As with the Zinman/Frank performances, my enjoyment of the music is enhanced when the solo violinist is not playing. Further, Spivakov is another "constant vibrato" violinist; that's three in a row now in this review, and I hunger for its absence. At any rate, don't get too excited about this set. Finally, top-rate performances courtesy of Julia Fischer. Her fame appears to be growing exponentially, and this new Mozart disc should add to the stampede. The bold and aggressive playing of Anne Sophie Mutter gives way to Fischer's intimate and creamy legato that is comforting and pure. Fischer offers an absolutely gorgeous set of performances with much less vibrato than Mutter, Spivakov, or Frank. Conductor Yakov Kreizberg and his chamber orchestra are very much in the HIP style and in complete accord with Fischer. Admittedly, neither Fischer nor Kreizberg delivers the utmost in excitement, preferring elegantly shaped phrasing that is most irresistable. Actually, "irresistable" sums up these reassuring performances, and the sound is state-of-the-art in both the regular CD and SACD format. I do wish that Fischer was more to the forefront of the production, because there are times when her projection is too polite and within the orchestral fabric. However, this is a small matter when in the presence of such lovely, humane, and refined playing. Most of the cadenzas are by Fischer, and they are entirely suitable to the emotional content of the music. The bonus pieces, K. 261 & 269, are also excellently played, but I would have liked another concerto instead of these two pieces that don't quite reach the quality of the five concertos. Overall, I place this new Fischer disc among the elite recordings of Mozart's Violin Concertos. It's a disc to curl up with when the world is looking bitter and unforgiving; Fischer takes us to the secure and loving home we all deserve. Just remember that Fischer is not the violinist to choose when you crave fireworks and adventures to distant lands. 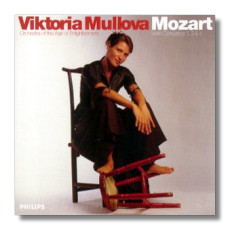 The last recording to review comes from Viktoria Mullova and the Orchestra of the Age of Enlightenment. Period instrument recordings of the Mozart Violin Concertos are few in number with only the Standage and Huggett sets readily available. Standage can easily be dismissed, as his interpretations lack character and he only knows one colour – gray. Huggett is much better; she has a personality. Mullova also has a personality: burnished, singing, and rather dark. Since this is the ideal musical personna for Mozart's slow middle movements, Mullova is particularly compelling in the three middle movements of the concertos with her smoldering intensity. She is also no slouch in the outer movements, taking an exuberant and playful stand; however, even here Mullova is transcendent in the more serious passages such as the one beginning at 1:40 into 3rd Movement of Concerto #3. As for Mullova's conducting, it is as crisp, active, and expressive as her solo playing. Her tempos are very much in the mainstream except for the quickly paced middle movements; although they can sound a mite too fast when Mullova's solo part is at rest, her entrance totally overwhelms all other considerations. The cadenzas are newly minted with Ottavio Dantone doing the honors excepting for Mullova's cadenza to the 3rd Movement of Concerto #3. For those not familiar with Dantone, he is an early music keyboard specialist who has recorded Bach's Well-Tempered Clavier and Handel's Suites for Harpsichord on the ARTS label. He is a superb artist, and his cadenzas along with Mullova's treatments are fully within the Mozart idiom and enhance the pleasures of listening to the disc. Sonics could not be better, as every note is clearly delineated in a perfectly resonant environment. If your preferences are with period instrument recordings of Mozart's orchestral music, the Mullova disc is a necessity and superior to both Standage and Huggett. Don's Conclusions: Five Reviews, two outstanding recordings – Fischer and Mullova. Concerning the comparison versions, the Standage/Hogwood is the only one not excellent or better. My two favorites for many years have been Lin/Leppard and Grumiaux/Davis. I don't know at this point if my preferences will change with Fischer and Mullova on board, but I will have a great time listening to these four versions in future months and making a decision.